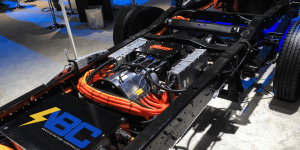 The contract involves the latest BMW i3 batteries, which now have a total capacity of 42.2 kWh following an upgrade with 120 Ah cells from Samsung. Motiv Power Systems will make the EPIC chassis equipped with these components available for their entire commercial vehicle range to be unveiled at the Work Truck Show 2019 in Indianapolis in March. “When Motiv specs a battery for a chassis, we are looking for factors that matter most to our end users. These include initial cost, reliability over time, and end-of-life replacement costs,” says Jim Castelaz, founder and CEO of the Californian company. The latest version of the BMW i3 batteries provides a convincing solution. “Our industrial clients welcome the usability of the ready-made technology that BMW i components provide, as well as their durability,” adds Uwe Breitweg, Head of Drive Systems for Industrial Customers at BMW. BMW battery know-how is already being utilised by another large commercial vehicle company. Turkish bus manufacturer Karsan uses i3’s motors and batteries and is already planning to use them for a second EV model. Moreover, electric boat maker Torqueedo has a longstanding partnership with BMW and uses the i3 battery for various applications. Also in California, batteries of the BMW i3 have found use as a stationary solution by EVgo. For now, the set-up is standalone, but EVgo says they are planning to expand such second-life applications. With their battery design in such high demand, it is no wonder that BMW was the first to second CATL’s plans to build a largescale battery cell factory in Germany. The Chinese supplier had delivered cells for the i3 battery initially and had recently accelerated their construction schedule for their planned facility in Erfurt reportedly. Battery cell production there may start as early as 2020.